where β is the radix of the floating-point system, m such that | m | < β is the significand of x, and e is its exponent. IEEE Computer Society. 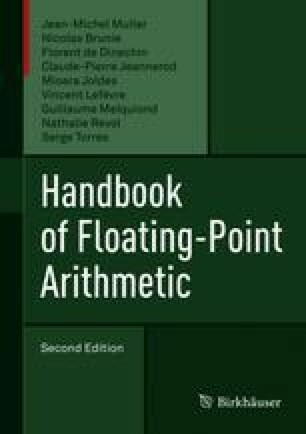 IEEE Standard for Floating-Point Arithmetic. IEEE Standard 754-2008, August 2008. Available at http://ieeexplore.ieee.org/servlet/opac?punumber=4610933. W. Kahan. Lecture notes on the status of IEEE-754. Available at http://www.cs.berkeley.edu/~wkahan/ieee754status/IEEE754.PDF, 1997. W. Kahan. A logarithm too clever by half. Available at http://http.cs.berkeley.edu/~wkahan/LOG10HAF.TXT, 2004.